The snow falls in lightly enough to see all around you but still blanket the slopes. The clouds keep the temperature at a balmy 0º c. You waddle, in your stiff plastic boots with your skis propped gingerly over your shoulder and poles sticking every-which-way, to the base of the lift. Less delicately than you meant to, you drop your skis yard-sale style, looking around hoping no one noticed. Or, maybe the weather is sunny and warm and the snow is quickly turning granular like corn. Perhaps you hit the heart of winter, and the ensuing blizzard is blocking all views, while nearby skiers excitedly talk of “freshies” and “face shots.” This is a choose-your-own-adventure. In one scenario, you bravely let your friends, family or spouse lead you up the lift. “Slide your skis like this, and follow me,” they instruct. Down you slide over and over, slightly terrified and falling often. Bitter remarks slip out of your mouth, and eventually resentment sets in. Alas, it is a rare spouse-teaching ski story that ends well. 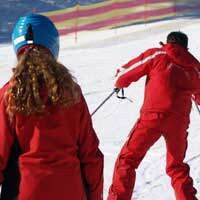 Therefore, you choose the other course: Greeting the class, your teacher shows you how to kick the snow off your boot using bindings or poles. With varying levels of clumsiness, you click your toes in and heel down snow free, ready to walk around with one ski on. Comfortable with the feeling of sliding you attach both skis and watch your instructor demonstrate the stopping motion. Attempting to coordinate both legs, you slide your heels apart trying not to cross your tips, often one leg sliding at a time. You practice until everyone’s mastered pushing both legs out simultaneously, making pizzas as well as any little ripper that flies down the hill. Gliding over to a slight incline, you learn to side step up the hill. This very important task will come easily to some, who’ll feel like skiers walking up a slope, while others will find it impossible, feeling like a clown trying to walk on water. When the teacher can’t watch any more and assumes you all understand the concept if not quite able to prove it, he demonstrates again a gentle glide down the slope ending with a perfect snowplow (pizza). Wobbly and possibly imagining a terrifying double black diamond incline before you, you too will attempt this first moment of skiing. For the next hour or so, a jerky Poma lift or magic carpet will pull you and your classmates to the top of the fear-filling incline. With increasing confidence, you’ll walk like a duck to your chosen spot and slide down the hill utilizing wedges (pizzas) of all sizes to control your speed and stop. Your balance will come and your feet will begin to feel like they’re actually under you. You’re skiing! Once or twice, you’ll fall on your hip or bottom and struggle to get up, the instructions your teacher gives not seeming to match what he is showing you. Nevertheless, eventually, it will all make sense and you’ll pop up like a punching clown doll. At the lift again, this time cutting, a ski school privilege, you carefully stop with your boots on the 'Wait Here' line. Awkwardly you’ll rush ahead, poles flying, just as the chair swings around and hits you, forcing you to sit. Scooting onto the chair, pulling down the safety bar and breathing again, you’ll enjoy the view, feeling the weight of your skis pull your knees and ankles. At the top, bar up, you try to remember what your teacher said about standing up, but the speed of the chair distracts you and you either slide off on your back down the ramp bumping into people and causing a bit of a tangle. Or, you stand up tall squishing your boot cuffs and glide off using your wedge to stop before you hit anyone. The much bigger slope may be intimidating, but your teacher has given you the tools to conquer and you follow his lead, turning ever so slowly down the hill. A few more attempts and you are dominating the lift, and actually skiing the slope with measurable speed, giggling and hollering back at your friends on the lift. At lunch, you realize you’re digits are cold and your legs hurt. Trading adventure stories, inhaling a burger and sipping hot chocolate (with or without whisky) you reenergize. Another choose-your-adventure moment, you either continue your lesson, or attack the hill with your friends. Either way, you’ll make some turns, take some falls, loose a ski and not be able to get it back on because the binding back will be popped up, meet some people on the lift, feel pain in your legs and feet, laugh a lot and suggest just one more last run, a few times!